As I mentioned in my last post, I believe I could use some more training in the water if I ever want to do another triathlon again. I think I added more distance by swimming away and then back towards the buoys. I was five minutes slower than my goal time in the water, and yet felt breathless jogging up to transition. 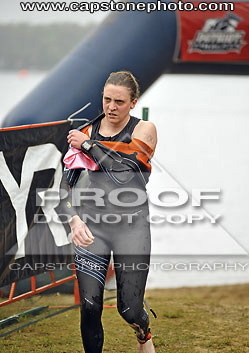 Official race pictures show an angry Molly. I thought I was happy that I finished the swim?!? I must admit, I felt really good on the bike. Despite my LSD training rides being no longer than 52miles, I finished the 56 miles faster than my goal time. I think all the hills around where I live really helped me physically, and the fact the race course was basically flat was awesome. I made sure to try to eat my GU chews as I practiced on my training rides, every hour, and hydrate. Racing on an overcast day helped as I didn’t have the sun beating down on me like Mooseman. I guess nutrition has a big part to play during a race. When I finished the bike portion, I thought, “I’ve got this.” Mooseman I didn’t make the cut off limit for the bike. And with this race, I had plenty of time to finish the run portion. I decided I now needed to use a quick stop at the porta john on the way out. At the beginning of the run, I decided I needed a plan to help me get through the half marathon. Yes, one would think you should have a plan set in place before the day of the race, but I don’t really function like that. Sometimes I work better under pressure. There was no music to keep my mind off of running, nor too many cheering crowds. From prior training jogs (which always ended up as fast walks) I knew if I started to walk, it would be difficult to start running again. Since there was an aid station/ water stop every mile, I planned on jogging to each water station, walk through the station to drink water, and then jog again. I had a gel around mile 3 and 7, and right at the start of mile 8 my race bib ripped away from my belt causing a small amount of anxiety as I do not run with spare pins. This actually seemed to keep me occupied for a while as I jogged: trying to figure out how to attach my bib (sound familiar?). Despite my trying to rig up something, I decided to bag any of my ideas and realized crooked race bib would simply have to do. Only the run is left to go! I heard my name and home town announced, something I never heard at Mooseman. 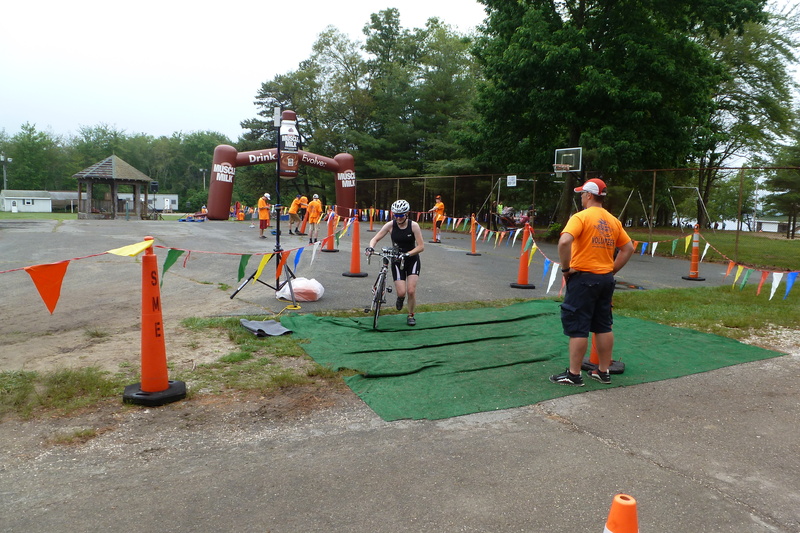 I finished my first full triathlon, not to mention, a half IM distance triathlon. In 6:36. I may not have placed, and I may not have finished in 6:30, but I originally set out to finish in the allocated time, and that I did. I managed not to have a panic attack in my wet suit, and finish without asking for assistance in the water. I was able to follow my nutrition plan on the bike and run. In September she finished her first oly triathlon and I had finished my first oly duathlon. 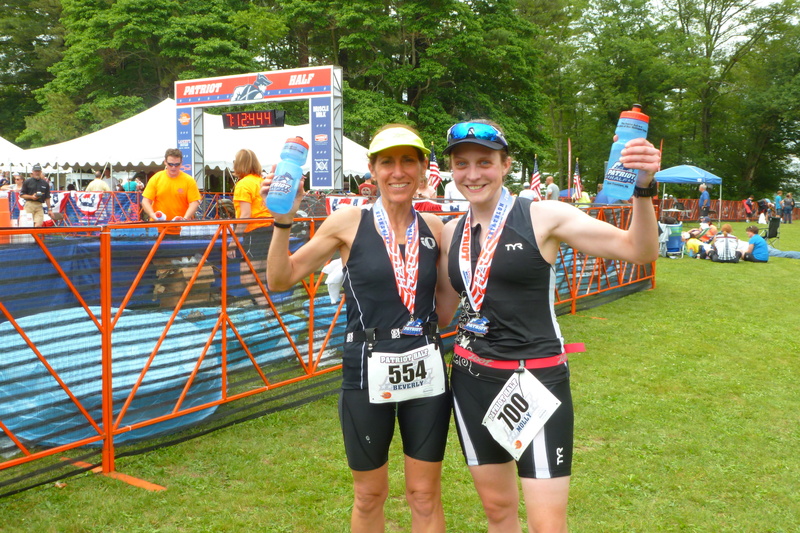 That day, we both finished our first 70.3 distance triathlon! 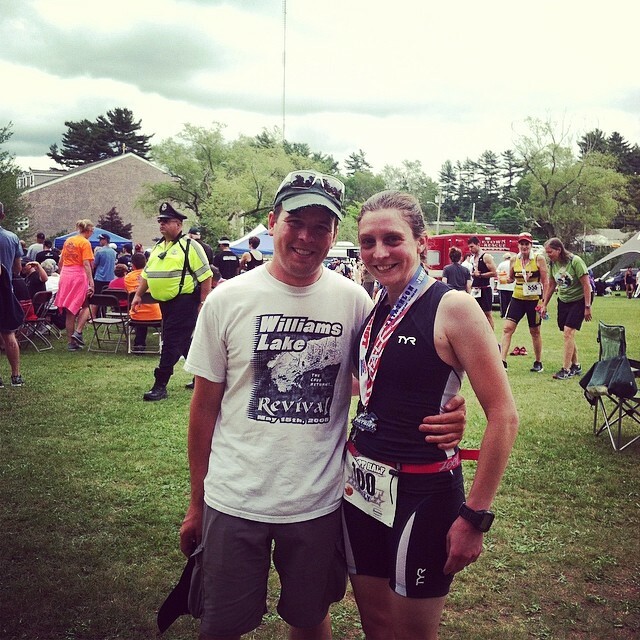 I was able to witness my Mountain Biking/Triathlete friend achieve third place in her first long distance triathlon as well. A huge thank you goes to my man for being there at the finish for me, and enduring 6 hrs of waiting and boredom. 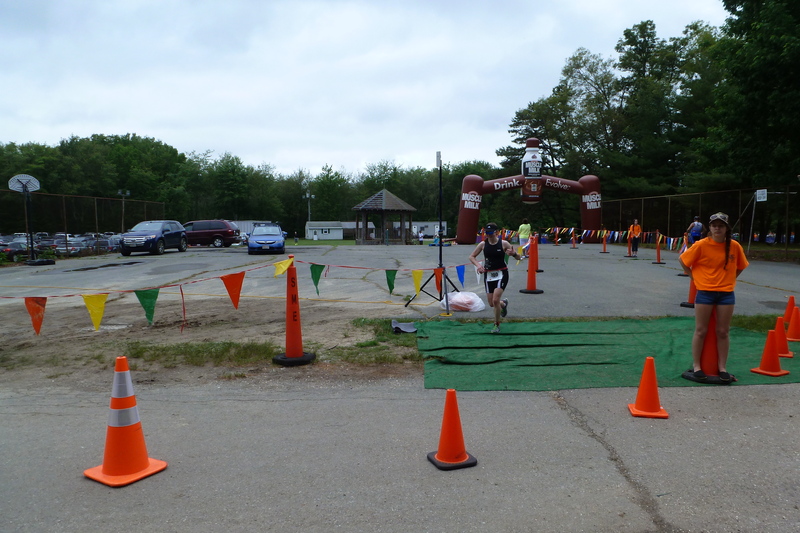 I remember on our drive to MA telling Kevin I just had to get through this race, and I would never have to do a triathlon or 70.3 distance race ever again. He told me he wanted a written, notarized statement from me saying that I would never want to do a 70.3 again. I suppose that is the effect pre-race jitters have on you. Who is this person in the sneakers? When was the last crazy post written? Sign up to receive updates on my adventures by email.